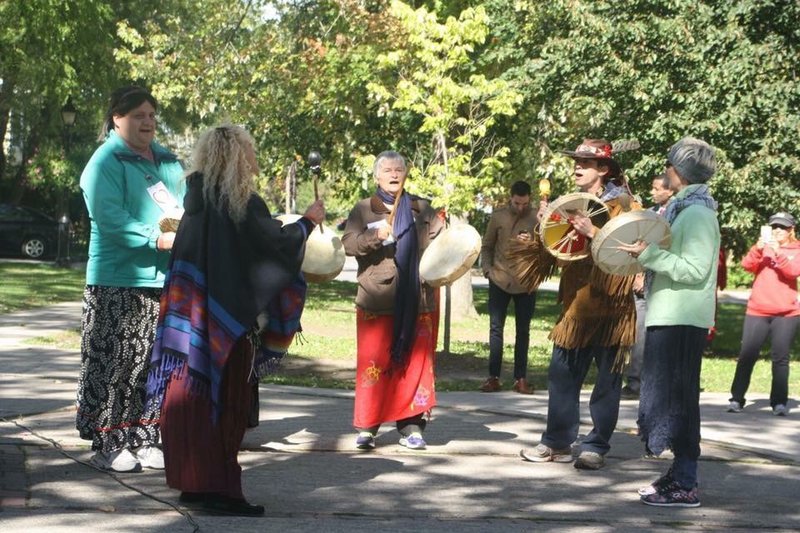 Grandmother Shirley Cardinal and Judith Matheson got the idea to start the Aylmer Drumming Group in 2011. They had a love for drumming and wanted to share it as a healing way to open our minds to live from our hearts. With the support of the late Drumming Co-coordinator of Peace Flame Drumming Group, Shelia Audrey, Spirit name Dream Writer, in which many members of this group first started drumming at Iskatew Lodge. Many also sat in the wisdom circles of the late Algoqnuin Spiritual Leader Grandfather William Commanda. Some Canadians see this Spiritual Leader as Canada’s Nelson Mandela. After his passing, in August 2011 a world wide celebration to honour all indigenous peoples of the Earth was created by the American Woman Visionary Barbra Marx Hubbard and the Shift Network. This initiative inspired Judith Matheson to train under Barbra to become part of many spiritual leaders all over the planet with a world wide celebration on Dec. 22, 2012 to Celebrate Humanity’s Awakening to bring forth a new Universal Humanity: Awakening in each other to the best in ourselves. This event was held at the Canadian Museum of Civilization (now Museum of History). Judith was the project manager with a core team of eight people, including Michelle Lascelle who with the help of hundreds of people and organisations created an evening to Celebrate the Mayan Calendar. A moment to acknowledge the time in which we are living and understand that is about awakening the evolutionary spiral of life to live the path of spirituality. This path in which all humanity is called to see the highest ideal of the spark of Creator God in one another and to be the love and peace we all yearn for. At this gathering, we were welcomed by Algonquin Grandmother Annie Smith - St. George. She welcomed us to these sacred unceded Algonquin Anishinabe lands and waterways where our original peoples have been since time immemorial. They lived and travelled one of the five most important River Watersheds on Mother planet Earth, the Heritage River, the Algonquin Ottawa River, that has been imprisoned for hydro since 1908. It is on this river that Champlain witnessed, with its magnificent Chaudière Falls which were visited by as many people as Niagara! Being blessed by the people giving thanks their for this magnificent, most richly healing area of our Earth. This area in the heart of Canadian democracy was recognised by these ancient spiritual nomadic peoples as a healing mecca. It was seen as spiritual place for healing and for rest, where they could give thanks to Creator for the peace they could experience so to trade in mutual fairness, equality and respect. At the event in December 2012, over four diverse drumming groups with many diverse singers and song writers shared their gift of song. With Mayan Elder Tito Medina, they created an evening in which we as Canadians from many diversities celebrated Birth 2012. The Universal Peace Federation, whose Leader Daniel Stringer moderated this event and we honoured Mohawk Elder Aboriginal Architect Douglas Cardinal who was a very good friend of Grandfather William Commanda and who continues to support his vision for his Algonquin people. He envisioned his people living in a Nation that works together linking minds and hearts in mutual genuine solidarity as all citizens are called to live and to work together to see Canada become A Culture of Peace and A Circle of All Nations. Willing the world to see in our unity in diversity that we are a Nation that is listening to the wisdom voices of the Elders and Grandmothers from all Cultures who bring to the world the message of hope and light touching darkness. As The Peace Ambassador Award has been awarded to such leaders as many Douglas Cardinal the vision of Grandfather to eventually see his people rise up to also have their voices heard, respected, and acknowledged, as they reclaim their ancient role to welcome all peoples to this Nation, to equally share the responsibility to truly walk gently with each other and with our One home. Remembering to care for nature as a way in which we all create the peace, the hope, the light in a world of darkness all humanity yearns to see. And to choose to reclaim the deep spirituality of all original peoples, our own real, genuine, authentic, relationship with the all that is. Now, calling humanity forward in 2018 to a new era of living peace, being love, all called to return to our own relationship to our hearts where drumming reminds us of our own collective calling as sacred lives birthed to make a difference for living life here on Earth from our highest spiritual loving selves. Healing pain and trauma, becoming the compassion and peace we all want to see as we are by living spirituality in unity becoming One Universal Human Family. On June 22, 2018 as Canada as a Nation awakens and is coming of age, we as a drumming group are blessed to experience both walking and working in genuine solidarity with Algonquin Elder Albert Dumont, Algonquin Grandmother Jane Ann Chartrand and Algonquin Grandmother Annie Smith-St. George and invite all citizens of the wonderful country to join us in your prayers or physical presence for a Canada becoming strong and free as we welcome all new citizens to a country where we are all very blessed to live on this sacred spiritual land to work and to heal to fulfill our own unique destinies for our souls to make a difference by our being blessed to experience life in this awesome country. Left to right are: Linda Laurent, myself Judith Matheson, and to far right Michelle Lascelle original founders of this group. Andrade Ana Gabriela and Kristine Kelly both were also part of Birth 2012 Event Ana has since moved on to other pursuits. Ana Andrade Gabriela has not been in our group for a few years many and some new folks and old folks missing as in time and flow of life things change. I would like to express, again, my sincere thanks to the three of you -- and through you, to Andrew and Judith -- for having accepted to share in our worship at St. John's today. The drum songs that you offered were a source of deep inspiration for all of us, and helped to make our gathering more sacred and meaningful. I am grateful, in a particular way, to Michelle, for undertaking to coordinate with Rev Catherine Askew, your participation in our celebration this morning. I do hope that there will be other times and occasions when we can be gathered together again. Until then and always, may the Creator's blessing be with you. Evensong Christ Church Aylmer, Gatineau Quebec. Open to all ages and all cultures. Drumming Awakens our own Indigenous Hearts. In songs and stories we remember.